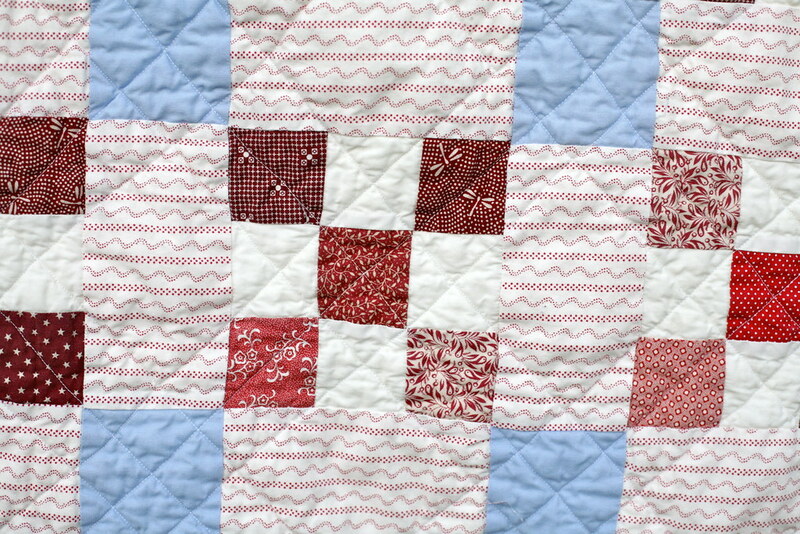 Inder Loves Folk Art: Christmas Sewing, continued: Gussie's Quilt. Christmas Sewing, continued: Gussie's Quilt. I shared the beginnings of this quilt in late September of last year, when my baby niece Augustine (Gussie) was born during what has turned out to be the only rain storm we've experienced this season! The idea of this quilt grew organically. I knew I wanted something relatively traditional that would complement the quilt that I gave to my niece Helen (also, oh my goodness, look at baby Joe!). And I knew I wanted something machine quilted, sturdy, and easily washable. I started by gathering red scraps (some awesome sewing friends dug into their scrap piles for reds for me) and making cream and red nine-patches. The little pile of nine patches lingered in my space for a little while I filled my Pinterest board with vintage nine patch quilts. I eventually settled on this approach, and went shopping for backing, sashing, and cornerstone fabrics. When I saw this adorable bunny fabric, I knew it would be perfect for the backing, and everything came together for a traditional, but hopefully fresh and light, 1940s-vibed baby girl quilt. Are those bunnies the cutest or what? (I need to clip a few stray threads there.) I chose a light stripey print for the sashing and a light blue solid for the cornerstones. I love the way the "low volume" red and light blue lighten up the deep reds. I don't have a design wall, and it is hard for me to lay out quilt pieces on the floor before sewing - within minutes, kids and dogs are all over it, making a mess. So in the end, the arrangement of blocks in this quilt was not just "studied random"; it was "actually random," which was actually pretty fun and freeing. When it came time to sandwich and baste, I had no choice but to enlist the local "help" - Maggie enjoyed handing me safety pins and trying to poke them into the quilt. 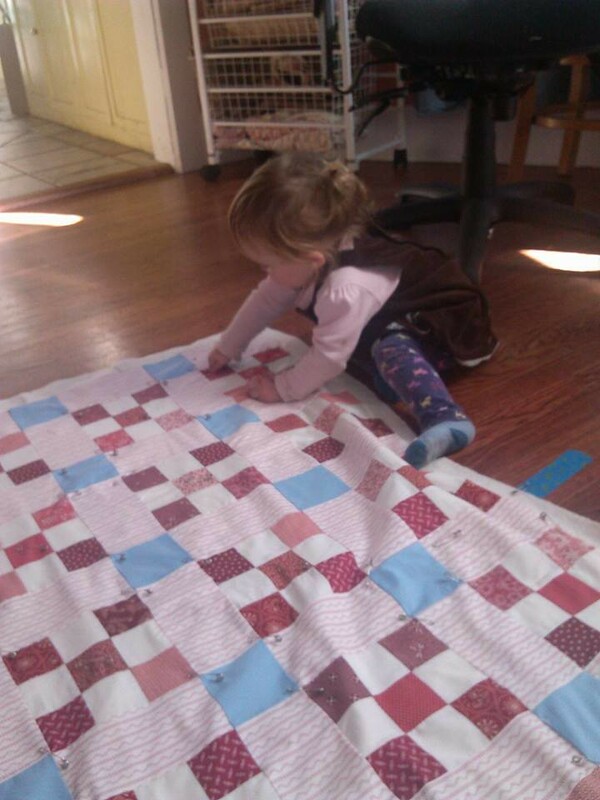 Allowing your eighteen month old baby girl to assist with basting a quilt is probably inadvisable on multiple levels, but it was far too cute to resist. 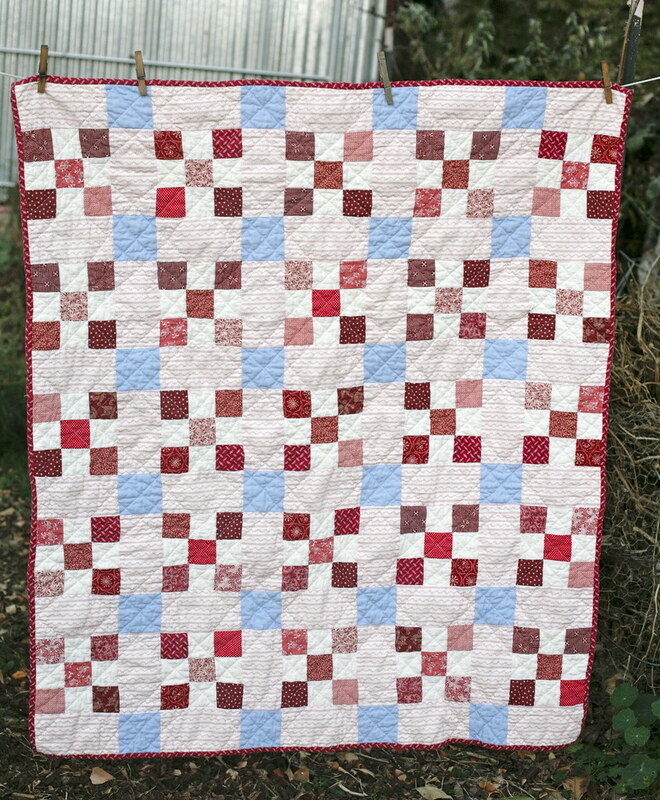 And overall, I was happy with how few puckers and issues I had machine quilting this baby. For her part, Maggie got through the experience with only a few minor pokes and learned some "pin safety." And I did manage to catch this overwhelming cuteness with my cell phone. Using a walking foot, I quilted relatively straight diagonal lines in white thread through the nine-patches, mostly eyeballing them. I fear I will never be precise enough to be a truly good quilter, but I think the final result is soft and "charming." Well, that's why I will never be a true "quilter" - because I find minor imperfections to be "charming"! Whereas we all know that quilters are detail-oriented, precise, and perfectionist. Me? I am a "good enough" kind of gal. You know, I wouldn't want to offend the gods with overly perfect work. This also explains my definitely imperfect embroidered label, see above. Joe has given this quilt his seal of approval, snuggling up under it while I was still hand-sewing on the binding. Hopefully Gussie will love it in the years to come as well. 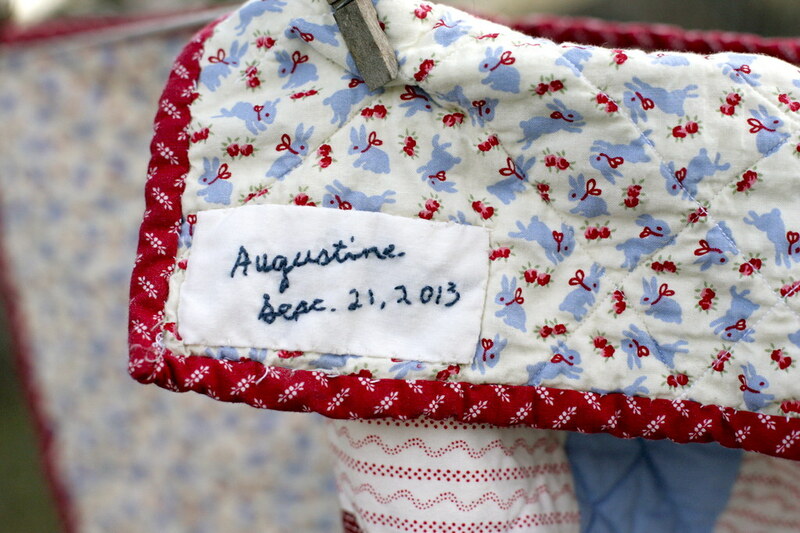 I think the quilt is lovely- and so special for your niece. I treasure the handmade quilts we have. I'm hoping to make a quilt for my daughter but am a bit overwhelmed by the big-ness of it and decisions about fabric. I've made lots of wall hangings and smaller pieces but nothing twin size. And your Seven Habits of the (In)Effective Quilter from that old post cracked me up! Thank you! And yes, haha, I still have most of those habits. I'm really slow at making quilts! This is beautiful! Great work, and what a treasure. Lucky Gussie! (And I love her name. I can so imagine Maggie hanging out with a Gussie.) 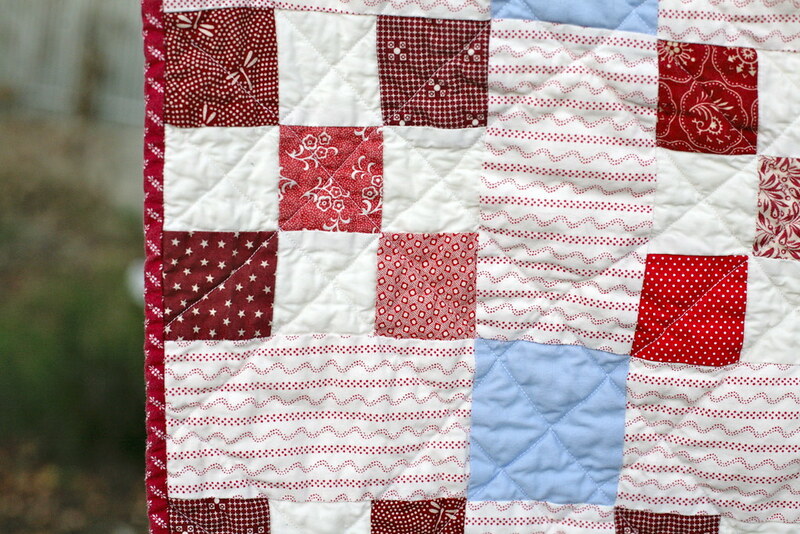 I love the vintage vibe of the quilt and the bunny backing fabric - eep! And no, one must never offend the gods with work that is too perfect. I grew up with a large woven wall-hanging in the lounge which had a rather obvious imperfection that I was told was for just this reason, so that lesson is ingrained in me!